This is the Japanese version of International Superstar Soccer. This is the first in the series, the second is Jikkyou World Soccer 2 - Fighting Eleven aka International Superstar Soccer Deluxe. Never could anyone have EVER dreamed of such an amazing soccer game on the SFC. 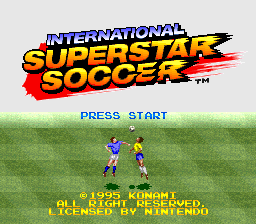 Konami spent a LOT of money coming up with a soccer game to be released for the USA World Cup. And it was money well spent on the GAME and NOT a license. 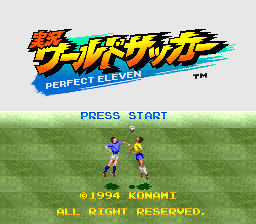 Before this game, all soccer games were of the arcade, kick the ball and run after it variety, but Perfect 11 came along and changed the way soccer games were made. The depth of moves and stats available is almost unbelievable for the SFC (this plays better and deeper than even Dreamcast / PS2 soccer games). All buttons are used giving it amazing controls and playability, BUT it doesn't just play like a dream, it looks and sounds like one too!!! Imagine PERFECT real speech commentary on your SFC, well this has it (in Japanese of course) AND a new sound system called Response Sound is absolutely jaw dropping!!! But not to be outdone, the graphics are easily the BEST of any sport game on the SFC, and contain animation you'd expect from a next-gen console!!! This is a MUST have game (even if you hate soccer, you will be in love with this) and I defy you not to get hooked forever on it's two player mode!!! Called ISS Pro in the west, this has had many sequels over almost every format, and when you play this, it isn't hard to see why! GENIUS!!! !